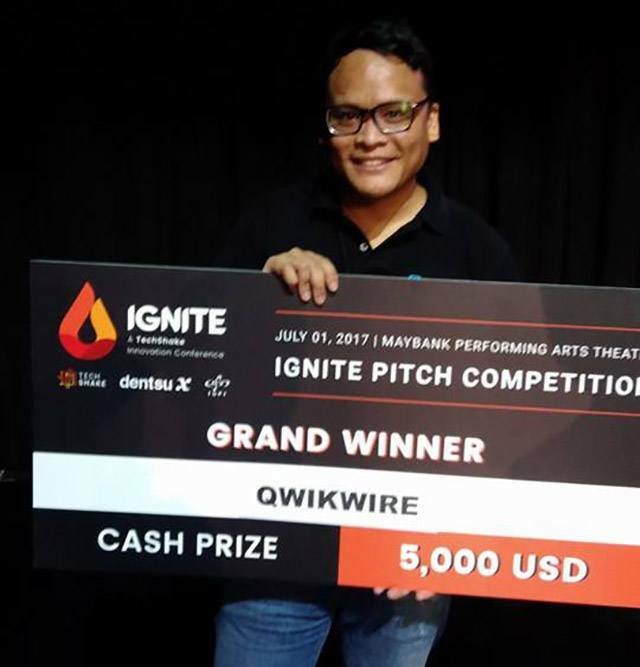 IMAGE Qwikwire bested nine other finalists at Ignite, a startup competition held on July 1, 2017. One of the country’s growth drivers in the past decade is remittances from overseas Filipino workers (OFWs). These transactions totaled $26.9 billion in 2016 according to data from the Bangko Sentral ng Pilipinas. A major use of remittances is for bills payments. But when sending money through a bank or a non-bank institution, OFWs have to rely on somebody else to withdraw the money and pay the bills for them. Oftentimes, the money is lost or diverted, and the bill remains unpaid past the due date. That’s the pain point Qwikwire aims to solve. The fintech startup, which was founded in 2013, acts as the middleman between a client based abroad and a Philippine company. Qwikwire partners with local businesses and creates a customized billing platform that enables them to accept cross-border payments directly. Qwikwire makes an average of 5.4 percent per transaction, which is shouldered by the company issuing the billing. The business model has proven to be effective, as Refundo revealed that they have been profitable since April of this year. “We did $3.5 million in transaction volume in our first 12 months. This year alone, based on our current numbers, we project to hit $10 million in transaction volume,” Refundo added. Based on these transaction volumes, the company averages about Php1.6 million in revenues per month. The company has also built a base of almost 900 users, 400 of which are actively using the platform. According to Elross John Pangue, head of business development and analytics, Qwikwire’s client base includes property companies, BPO firms and a bank. Pangue also revealed that its biggest client is real estate developer Century Properties, who has worked with them since the first quarter of 2016. The company is aiming to expand regionally, eyeing neighboring countries like Vietnam, Cambodia and Thailand. “There’s a huge opportunity there,” said Pangue. He added that Qwikwire also wants to sign up more more banks and exporters as clients. The competition was part of Ignite, a one-day innovation conference that featured talks from both local and foreign startup veterans and venture capitalists. The conference was organized by Techshake, a Philippine media company focused on the country’s startup ecosystem, in collaboration with Japanese media agency dentsu X and Japanese management consultancy firm IGPI.